Included in this 4 Centerpiece Set: 12 - 3.25" x 10.5" Cylinder Vases 12 - 3.25" x 9" Cylinder Vases 12 - 3.25" x 7.5" Cylinder Vases 12 - Square Mirror (Choose your size) 36 - 3" Floating Candles (Choose your color) We take the guessing of decorating for an event out of the equation! By providing you with this fabulous set of Cylinders, Floating Candles, and Mirror, your table centerpieces are ready-to-go! Simply add floral or other items of your choice to your Cylinder Vases. 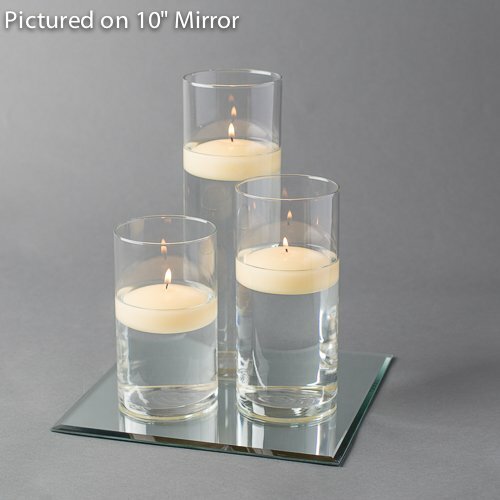 They will sit atop a beautifully reflective mirror, and in minutes achieve a look that you and your guests will love! Planning a Wedding, Corporate, Church or Charity event? Then this set is for you! This ready to use, graduated set of 3 vases takes the guessing out of decorating! With three sizes that add levels and dimension to your table, this set works fabulously for event set-ups. This Set Includes: 36 - Richland Floating Candles 3"